Materials from the original structure were re-purposed for the new one. Around 80% of the old metal became trusses and frames for the roof, and wood was reused as flooring and eaves. When BAAD Studio principal Benjee Mendoza first visited the two-storey R House he was hired to renovate, he was surprised by its good ventilation. Wind passed freely through despite the small window openings, so heat didn’t build up in any of the interior spaces. The house was cool even during the summer months, and the family seldom used air-conditioning. The original structure was built in 1994 inside a private family compound. “Our redesign of the house had to both sustain and improve the way they lived, not change it,” says Mendoza. The north entrance of the house. Three-meter eaves shade the doors and windows of the ground floor, protecting it from sunlight and rain. Re-purposed tanguile from the old house was used for the eaves. By studying the sun path using a 3D model, the BAAD team angled the eaves to protect the house from the 3 o’clock sun. The client originally had the eaves cut down to two meters to save on costs, but they had to bring it back to three after water entered the living area when it rained. The original structure was built in 1994. The facade of the old house was completely overhauled by the BAAD team, and several partitions inside were brought down in order to maximize space and air flow. There were no clerestory windows for hot air to escape from, but the interiors were cool nonetheless due to trees that surround and shade the house. This proved to be a challenge, as the brief necessitated a major renovation. The client’s three children were growing up, and each wanted their own bedroom after sharing one in the old house. The creation of three new rooms on the second floor meant expanding the house footprint and roof area, and changing the floor layouts. Mendoza saw this as an opportunity to further improve passive cooling and cross-ventilation in the house. Many architects just don’t get passive cooling. They bandy the term about while touring us through residential projects, but the warm, sweat-inducing interiors prove they don’t know what they’re talking about. Simply put, passive cooling is minimizing a building’s heat gain and maximizing its heat dissipation with little to no use of electricity. First and foremost, keep unwanted heat out, then, provide openings for cool air to come in and outlets for hot air to continually escape the building. But because of ignorance, and sometimes, pure laziness, some architects are content to let air-conditioning do the job of cooling interiors. Some claim it is the client’s fault for requesting design features that interfere with passive cooling. Whatever the reason, because we live in the tropics, it is the architect’s responsibility to create climate-sensitive design to inhibit discomfort for users of the house, help the client save on electrical costs, and reduce the carbon emissions of the household. The house has two entrances, one on the north side and another on the east. When coming in from the east entry, visitors are greeted by the staircase leading to the second floor. The BAAD team preserved the original staircase, repainting the risers and re-cladding the treads with wood to match the interior design scheme of the renovated house. A stray column from the old house stands between the dining and entertainment areas. It was painted white to disappear against the white walls and ceiling. During visits to the site before construction, the BAAD Studio team identified the factors that contribute to the house’s good ventilation. The site conditions are favorable—large, shady trees inside the compound and ample setback from other houses, allowing air to travel unimpeded. The house and its windows are oriented to catch the southwest wind. The trees on the south side of the lot shade the house during the afternoon, and, just as important, they keep the air above the ground cool. If a bare cement area exposed to the sun surrounded the house, the hot surface would heat up the breezes traveling over it. Following the client’s brief of increasing the number of bedrooms, a 200-square meter extension to the south was added to the original structure, bumping up the total footprint to 420 square meters and splitting the house into north and south wings. The ground floor is dedicated to public spaces such as the living, dining, and kitchen areas while the second floor contains the master bedroom and three children’s rooms. The trees in the south side were kept, where they became part of a small garden. Because of the expansion of the house’s floor area, copious space on the ground floor was created. The BAAD team preserved this spaciousness by doing away with partitions or sliding doors to separate each area. This created a wind corridor for cool air coming in from the garden to blow unimpeded through the dining and entertainment areas in the south wing, and travel up and out the clerestory windows in the double-height living area of the north wing. The clerestory windows are critical to achieving passive cooling. Without these openings, warm air (which always rises over cooler air) would be trapped and heat would accumulate in the house. Without these openings, the entry of cool air would be reduced, further warming up the interior spaces. It is the vacuum created by air leaving a space that aids in sucking in fresh air. Such air movement is maximized when the openings for air to enter and exit are at the opposite ends of a space. The swimming pool of the neighboring house helps cool the winds coming from the east and north. Maximized air movement results in maximized air exchange, that is, from one end of a space all the way across to the other end, hence the term, cross ventilation. One cannot overstate the importance of intakes for cool air at ground level, exits for warm air at the highest reaches of an interior space, and the absence of obstructions for air to make its way from entrance to exit. To further mitigate heat gain, louvers on the upper glass windows act as brise soleil. 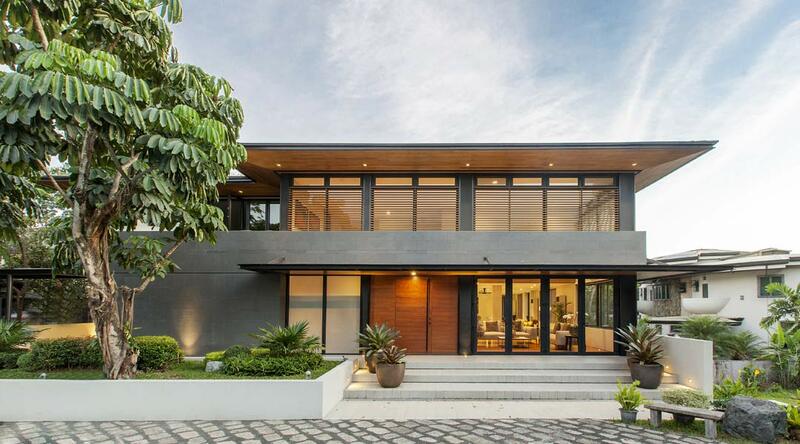 They soften the house’s exterior as well. This meant controlling heat in the west- and south-facing areas. Double walls were put up on these sides of the ground floor to insulate the house against the afternoon sun. While the second floor didn’t make use of double walls, three-meter eaves keep the interiors shaded during the hottest times of the day. Large windows on the west- and south-facing areas have proven effective in taking in as much wind as possible. The client insists that opening the windows in the informal dining area, which overlooks the south garden, is more than enough to cool the entire ground floor. The same goes for all the bedrooms on the second floor, as windows positioned across each other allow for cross ventilation. True enough, I frequently felt a light breeze wafting into the ground floor during my visit on a hot Thursday afternoon in April. Mendoza says connecting the existing structure with the new one was the most challenging part of the construction process. Because of the rearrangement of the layout, several beams and columns had to be removed and shifted around. However, the original structure’s changing grid lines prevented them from moving two columns on the ground floor, because doing so would have removed structural support for the upper level. These stray columns stand in the middle of the dining and entertainment areas. While the R House was blessed with favorable site conditions, the BAAD Studio team deserves praise for designing a house that takes full advantage of them. Heat build-up is minimized, the site’s natural breeze is harnessed, and heat is allowed to escape. With an architectural design that’s sensitive to the comfort and lifestyle of its owners, passive cooling is clearly not just a fancy term for this house. This article first appeared in BluPrint Vol 3 2016. Edits were made for Bluprint.ph.